Grilled Chili Lime Chicken Skewers | Homemade & Yummy Homemade & Yummy | Fun delicious recipes and more. Grilled Chili Lime Chicken Skewers are perfect for backyard BBQ feasts. Seasoned chunks of chicken along with veggies, are easy to make, and always a hit!! We can never get enough grilling season around here. I know you can grill in the winter (and we do occasionally), but there is something about summer grilling that is so much more enjoyable. For one thing, it is the nice warm weather. The backyard BBQ parties would be a little cold in the winter months. My husband loves his bbq, so much that we have two, one gas and one charcoal. He certainly loves experimenting with both, and hey he has me in the kitchen to give him something to experiment with. Never a shortage of ideas in this house. Kabobs are always a hit with us. So many variations that you can never get tired of eating them. You can just about choose any meat, fish, veggie or fruit and come up with loads of combinations and grill till your hearts (or stomachs) content. You see kabobs already made up in the meat section of the grocery store. They are so easy to do, so you don’t need to spend the high price they charge in the store. With a few ingredients and a little effort, you will become the kabob pro in no time. 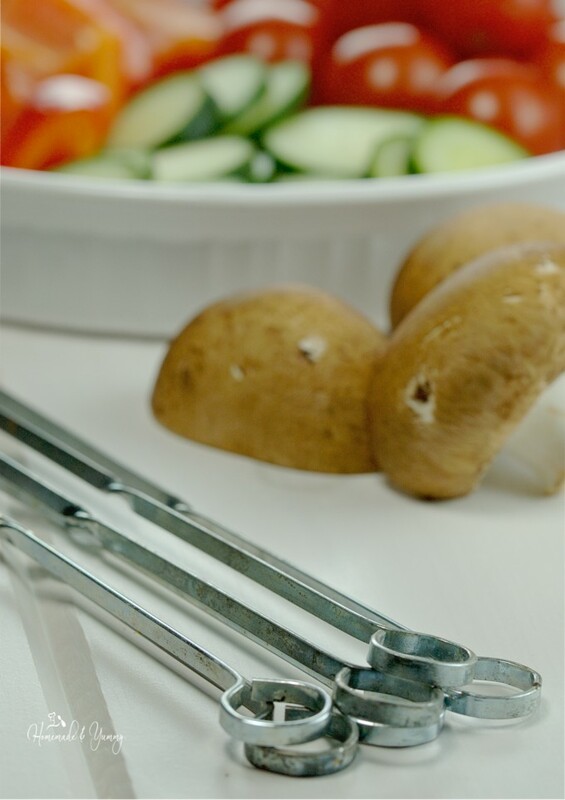 For the skewers, you can choose stainless steel which is reusable, or you can purchase single-use bamboo. The stainless steel version can also attach to your rotisserie if you have that feature on your gas grill. 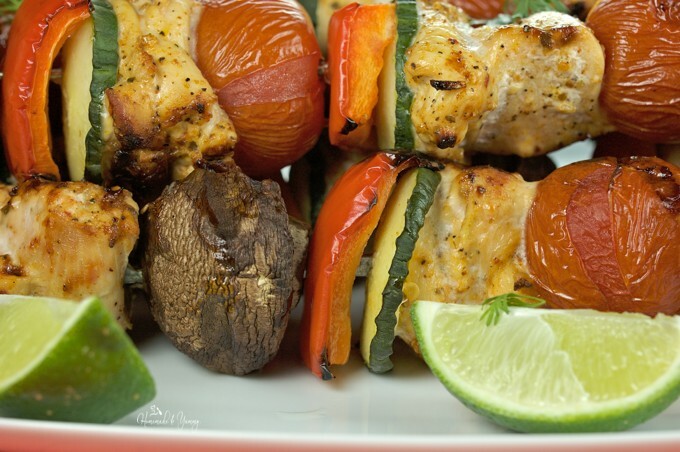 Our Grilled Chili Lime Chicken Skewers consisted of chunks of chicken that were marinated in chili-lime seasoning and avocado oil, along with pieces of red pepper, cucumber, mushrooms and cocktail tomatoes. Grilled to perfection they are awesome along side a salad or two and believe me your guests will be thrilled. 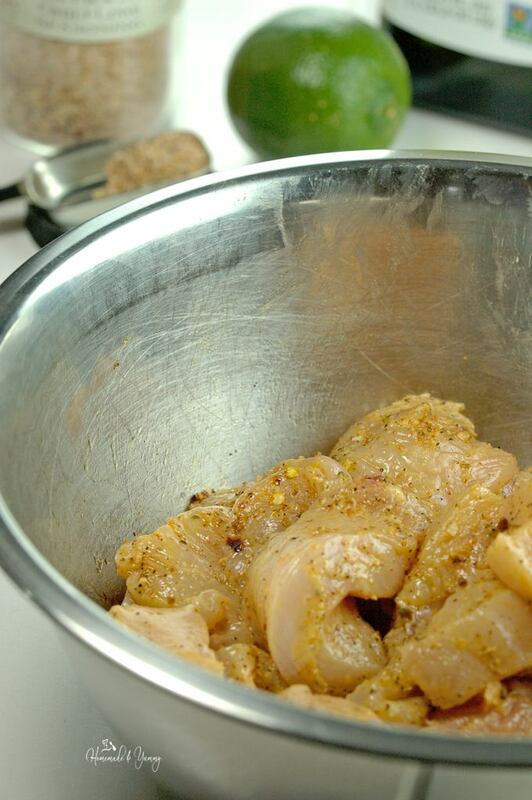 Start by cutting your chicken into nice chunks. Coat the pieces nicely with the oil, sprinkle on the seasoning, rub with your hands to distribute, and marinate in the fridge for about an hour (or longer if you wish). While that is happening, wash and cut your veggies into bite size pieces. I leave the tomatoes whole, and even the mushrooms if they are small. Get your skewers. If you are using bamboo, be sure to soak them in water before assembling the kabobs. Now comes the fun (and easy part). Put the meat and veggies on the skewer. There is no right or wrong way to do this, arrange them however you like. I like to have a few pieces of veggies clumped together between the meat pieces, but the choice is yours to make. Get your grill ready. Hubby did these on the gas grill at about 325º F. Oil the grill before you place your kebobs on to cook. He gave them 1/4 turn every 5 minutes or so. Cook until the meat has reached your desired level of doneness. Since these are chicken, we wanted them cooked through and this took about 30 minutes. Once done, place on a serving platter, squeeze with a bit of fresh lemon juice, and garnish with a bit of cilantro (optional). There you have it Perfect homemade kabobs that are easy to make and delicious to eat. Next time you are tempted to buy ready made kebobs at the store, remember these Grilled Chili Lime Chicken Skewers and how easy they are to make at home. Have fun coming up with your own creations and stop paying the high prices at the store. Happy grilling!! If you love grilling as much as we do check out Simple Grilled Veggies or Zucchini Burger with Sriracha & Pancetta. Sign up for my WEEKLY NEWSLETTER and grab your FREE printable. Wash chicken breasts and pat dry. Cut into chunks (about 1-inch size). Coat with 1 tbsp. of avocado oil. 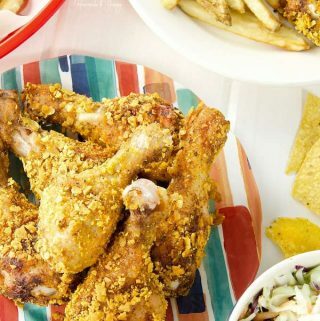 Add chili-lime seasoning, and rub with your hands to distribute over pieces. Place in fridge to marinate (for 1 hour or longer). Wash and cut veggies into chunks. Preheat grill to medium (about 325º F). Skewer on meat and veggies (alternating groups of veggies between the pieces of meat). Using the remaining oil, coat the grill before placing on the kabobs. Cook until your desired level of doneness (turning 1/4 turn every 5 minutes). 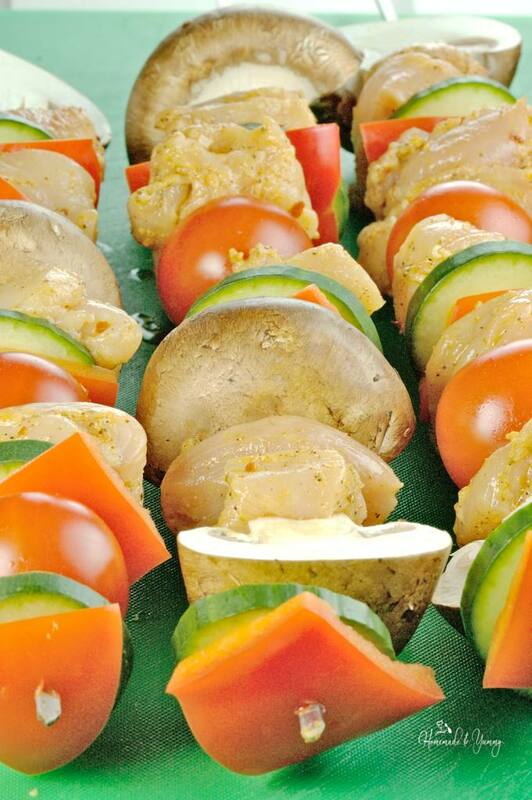 Transfer cooked kabobs onto a serving platter. Squeeze the fresh lime juice and add garnish. These look so delicious!! We are big on skewers in our home.. My husband will eat anything on a stick!! Must make these for him. The really are easy and delicious. 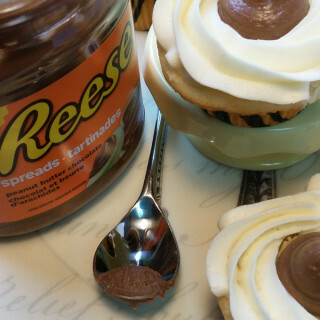 Yea I need to make these this week!!!! Love the chili lime spice on there!! Hope you give them a try…they are delicious. 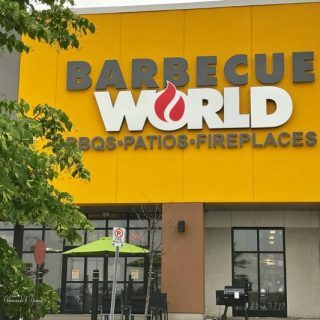 I don’t have a grill, but I do have a grill pan… The chili lime seasoning sounds interesting – I’ll have to see if our store has it. It would work on a grill pan!! 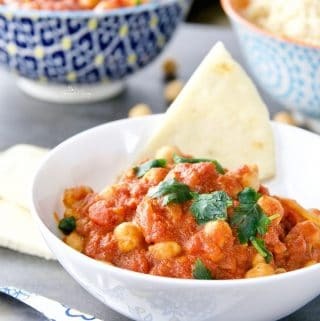 Such a healthy quick recipe, and packed full of flavour too. Will be making this soon. Hope you enjoy them…we sure do. Kababs are always a hit in our household too! 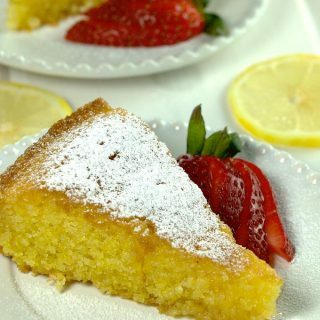 This is a such a simple yet great recipe! 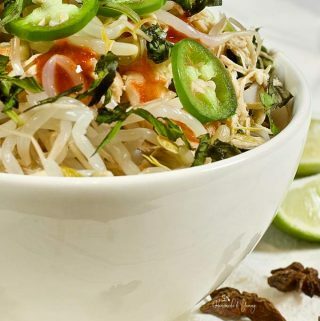 Anything with fresh lime is so good for the summer and I am loving all the veggies on this too. Yes it’s pretty healthy for sure. These looks tempting1 I wanna grab it from my screen lol! I’m sure my family would love it and great this coming Weekend. Well they are delicious and so easy to make as well. Well when grilling season comes around enjoy. Are you in Australia perhaps? 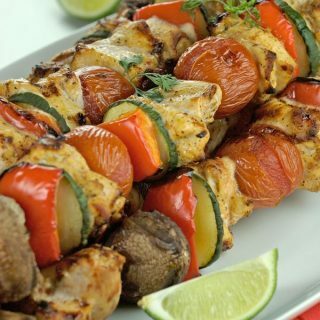 Ooooo these chick skewers look amazing!!!! 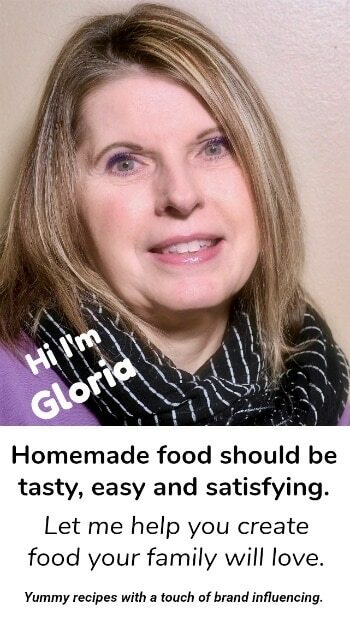 I must give your recipe a try! Hope you do, and ENJOY! This looks amazing. I love to grill in the summer. There is nothing like some fresh grilled chicken and veggies. Chili lime is the best. Love the chili lime combo too. Oooh lime instead of lemon. There’s a twist I’ve not come across before. Great idea! Chili lime is the best!! 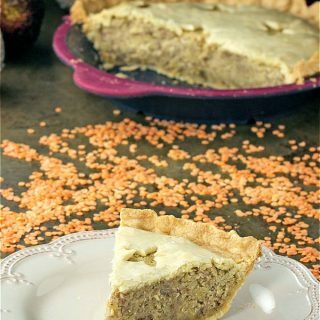 Yes healthy, tasty and so easy to prepare. They look and sound so good. That chicken looks like it is cooked perfectly! Nic and juicy! Yum! Thanks…I will let hubby know! I just love the idea of skewers. You can pack (literally) all the things you like onto one skewer and grill away. The grill then imparts such good flavor to each ingredients. I like what you used and the colors. Thanks so much, they did turn out really well. We’re the same as your husband with the two grills. Its so easy to cook outside in the summer. 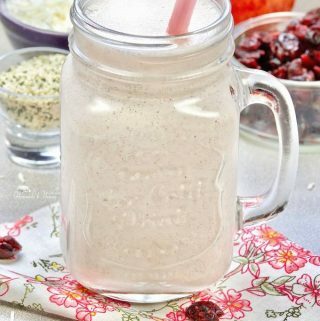 This recipe is jam packed with flavor which is just perfect for quick cooking! Pinning! Yeah…two grills…you know what I mean. 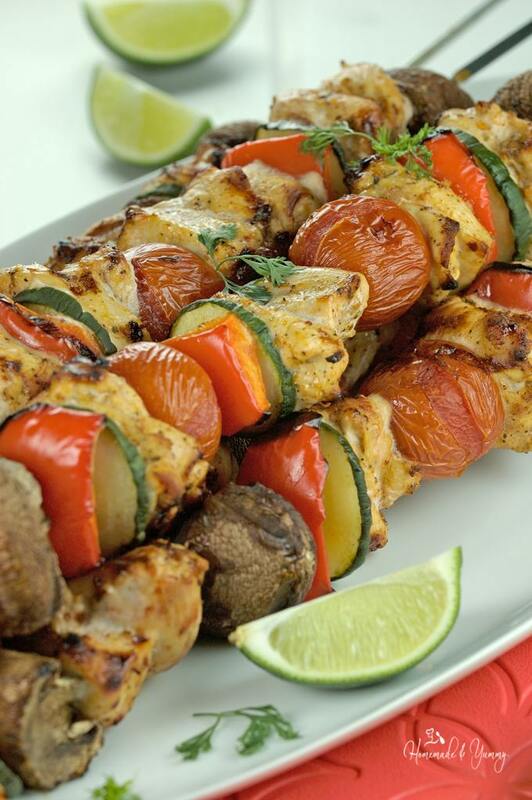 These chicken kabobs look absolutely delicious! Love the addition of mushrooms! Thanks…yes we like the mushrooms too. I like BBQ. This one is a nice dish, I will try this skewer on the coming weekends. It seems like it’s been forever since I made kabobs of any type. I would love to make these when the temperature isn’t so hot outside (90’s). They sound and look delish! These are perfect for the grill…keep the heat out of the kitchen!! Chicken and lime! What a beautiful combination. I really like skewers as well because there’s so much that you can do with them, especially during the summer! It’s so nice to have a grill and just fire these up whenever the family is craving for them! Thanks for the lovely recipe! You are very welcome. Thanks for stopping by!! Those sound and look SO good. My mouth is literally watering. They would be perfect for an upcoming cookout that we are having! 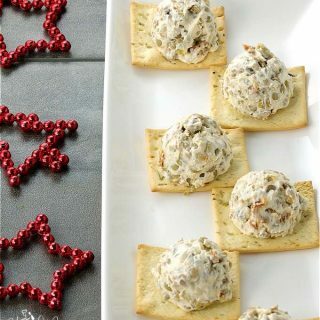 They are perfect for a crowd….and disappear fast!! You can easily adjust the amount of seasoning to suit your taste!! OMG this looks AMAZING!! i do love me some grilled chicken and veggies. I am so making this this weekend. Hope you enjoy them…they are so easy!! These look amazing! I’ve never been a big fan of kabobs, but hubby sure does like them. We will have to give this a try. 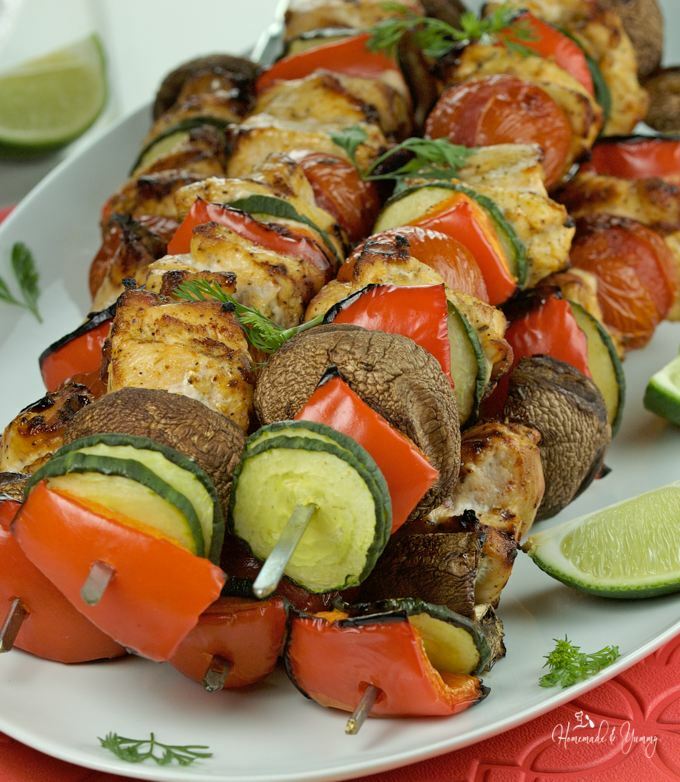 Kabobs are so easy and delicious…the combinations are endless. OMG!! 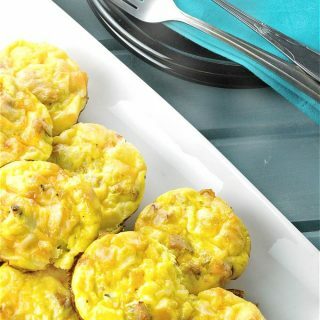 They Look Delicious And Healthy Too I Will Be Making This For The Family Thank You!! You are correct…healthy and delicious!! HAHAH…yes meat on a stick is very popular…and so easy to do. Kabobs are always a hit on the grill at our house too! 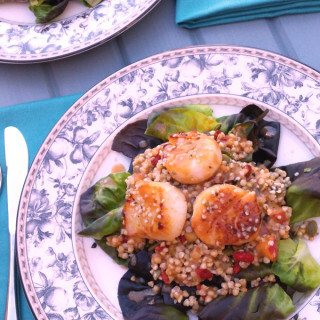 We’ll have to try this recipe on either our charcoal or gas grill (yep, we have both too). LOL I think the flavor sounds amazing! These look incredible. We had kabobs the other day that were so delicious … over at a friend’s house. I will pin this one for the future! They have got to be one of the easiest things to put together!